There’s a woodworking maxim that goes “you can never have too many tools.” No one ever mentions the accompanying maxim though: “…there’s never enough room.” This holds true for wood too. 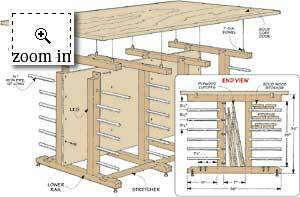 Some lumber storage solutions go above and beyond. I selected these either because of high-efficiency or high wow-factor. Yes, I am easily impressed – that’s what makes my job so much fun. 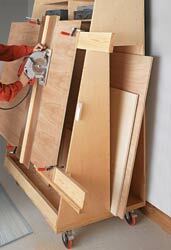 Ideal for that wasted space above garage doors… This is the garage woodworker’s dream come true. Get out of TOWN. 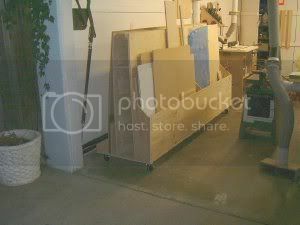 Not only is this sheet good storage unit on rollers for added convenience, but there’s a dang panel-cutting jig on the front of it. This one’s a big time overachiever. 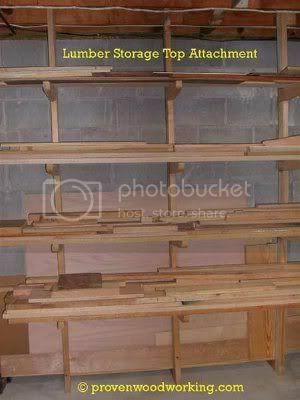 “a lumber rack capable of storing over 1000 bd ft of lumber for around $200” For straight-ahead lumber storage you won’t beat this one for efficiency. Why reinvent the wheel. It’s not wall mounted… but it is SWEET. Keep lumber off the floor. Especially concrete floors – concrete is porous and will “feed” water into your lumber. 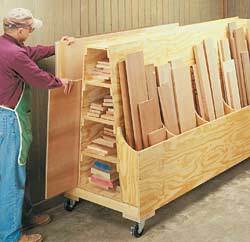 Allow wood to stabilize in your shop – it will need to sit for several weeks to acclimate. Mark your wood with its size for easy reference. Treat the ground under storage sheds for termites. 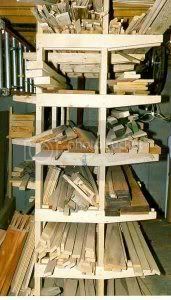 Is this a sound lumber storage idea?